Apply for the Green card. 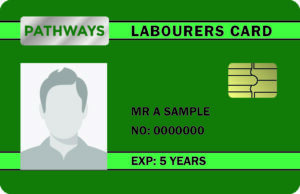 Ideal for anyone wishing to apply for the Construction Skills Certificate Scheme (CSCS) Labourer Card (Green Card), necessary to work on a UK construction site. The Level 1 Award in Health and Safety in a Construction Environment qualification is for anyone who currently works in construction or wants to work in construction, as well as for those already in the industry looking to refresh their knowledge. It is ideal for anyone wishing to apply for the Construction Skills Certificate Scheme (CSCS) Labourer Card (Green Card), necessary for work on a UK construction site. You will need your certificate for passing this course before you order your CSCS Card. These can take between 5 to 10 working days.